Although these multiagent regimens result in high response rates, approximately 20% of patients with follicular lymphoma have disease that relapses within 2 years of initial treatment.3 Retrospective data analysis shows that the 5-year overall survival rate for this subset of patients is significantly lower than for patients with follicular lymphoma that does not progress within the first 2 years of treatment—50% versus 90%, respectively.3 Researchers continue to explore novel combination regimens to enhance complete response rates and overall survival for patients with untreated follicular lymphoma. Eight 21-day cycles of cyclophosphamide, vincristine, and prednisone (CVP). Obinutuzumab was not investigated in children. The FDA approval of obinutuzumab, an intravenous monoclonal antibody that targets CD20, as first line treatment, in combination with chemotherapy, for patients with newly diagnosed follicular lymphoma, provides a novel treatment option for patients diagnosed with this disease. 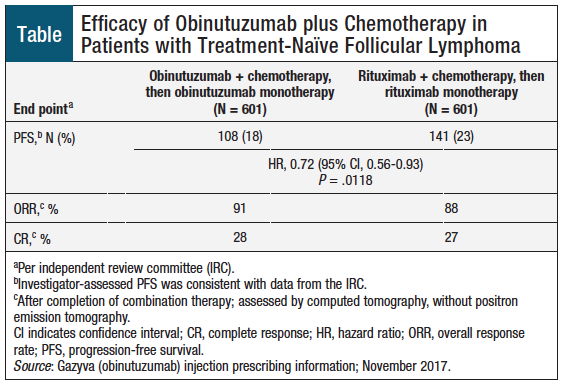 Results of a large, phase 3, randomized study demonstrated that the use of obinutuzumab, in combination with chemotherapy, is safe and significantly prolongs PFS in patients with untreated follicular lymphoma. 1. Leukemia & Lymphoma Society. Treatment for indolent NHL subtypes. www.lls.org/lymphoma/non-hodgkin-lymphoma/treatment/treatment-for­indolent-nhl-subtypes#follicular lymphoma. Accessed January 16, 2018. 2. National Comprehensive Cancer Network. NCCN Clinical Practice Guidelines in Oncology (NCCN Guidelines): B-Cell Lymphomas. Version 7.2017. December 5, 2017. www.nccn.org/professionals/physician_gls/pdf/b-cell.pdf. Accessed January 16, 2018. 3. Casulo C, Byrtek M, Dawson KL, et al. Early relapse of follicular lymphoma after rituximab plus cyclophosphamide, doxorubicin, vincristine, and prednisone defines patients at high risk for death: an analysis from the National LymphoCare Study. J Clin Oncol. 2015;33:2516-2522. 4. US Food and Drug Administration. FDA approves obinutuzumab for previously untreated follicular lymphoma. November 16, 2017. www.fda.gov/Drugs/InformationOnDrugs/ApprovedDrugs/ucm585660.htm. Accessed January 16, 2018. 5. Gazyva (obinutuzumab) injection [prescribing information]. South San Francisco, CA: Genentech; November 2017. 6. Drugs.com. Gazyva approval history. www.drugs.com/history/gazyva.html. Accessed January 16, 2018. 7. US Food and Drug Administration. Obinutuzumab. February 26, 2016. www.fda.gov/Drugs/InformationOnDrugs/ApprovedDrugs/ucm488013.htm. Accessed January 16, 2018. 8. Marcus R, Davies A, Ando K, et al. Obinutuzumab for the first-line treatment of follicular lymphoma. N Engl J Med. 2017;377:1331-1344.